This was my dinner last night. Sprouted Moong curry or Moogachi Usal, some raw onion slices, hot phulkas and pure ghee (sajook toop in Marathi – I just love saying it :)) on the spoon. Reminds me of the old wada ( building) in Pune that I grew up in. 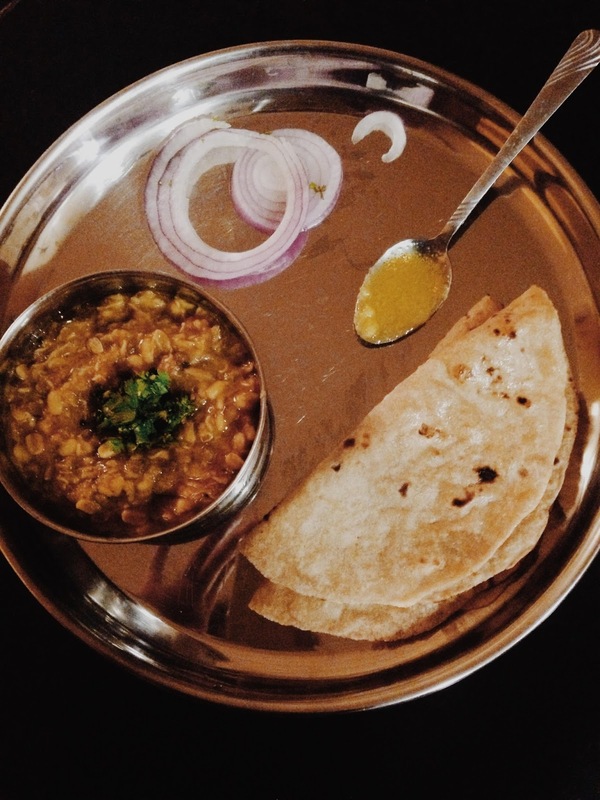 Our landlady, a grand old Maharashtrian lady would make this on a regular basis and we would gobble up whatever she would send upstairs to our house. My mom got this recipe from her. Eventually she (my mom) learnt many more such recipes from her. 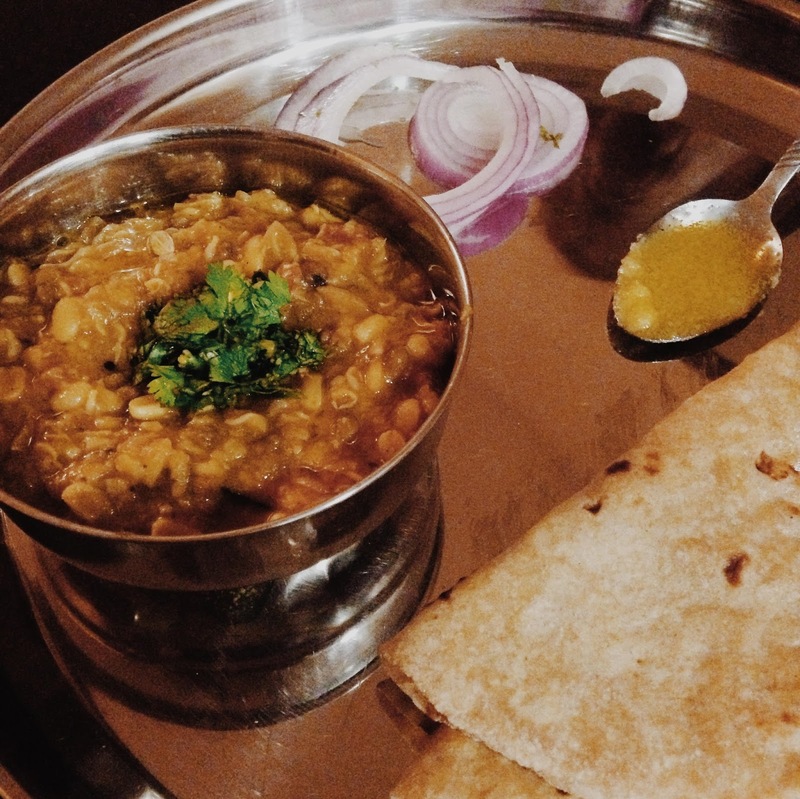 And now Maharashtrian food is a staple for us, just as South Indian food is. This usal is traditionally made with matki but you can use any kind of sprouts you have on hand. In a small pan, saute the onions and garlic till the onions turn nice and brown. Off the heat, add the ginger, cilantro, coconut, red chili powder and goda masala. Once it cools, grind this into a smooth paste. In another pan, heat oil and add mustard seeds and jeera (cumin) seeds. Once they splutter, add onions. Once they’re translucent, add the ground paste and cook for a couple of minutes. Add chopped tomatoes and saute. Finally add the cooked sprouts, jaggery and salt to taste. Let it cook uncovered for a few more minutes. Taste for seasoning and take it off the heat. Garnish with cilantro and a dash of lemon juice. And there you have it! Bon Appetit! or should I say, khaun taak! Hema , Moogachi Usalh with Phoolkas smeared with Sajook Toop. Heavenly … We Maharashtrians love it. Some day, when you have left over Moogachi Usalh , try making Misalh , by adding Farsaan mix and garnishing it with Onion , tomato , coriander leaves. It's a special Marathi Chaat item , you will relish. About Pune and the wada-culture , you should write , readers would love it surely.